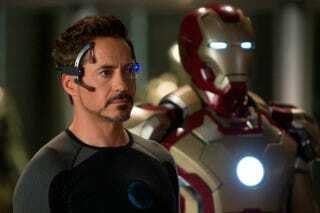 No Iron Man 4, Says Robert Downey Jr.
We all kind of knew this, but Robert Downey Jr. confirmed to Variety that there are no plans for an Iron Man 4. So whatever dates are still left unclaimed on Marvel's schedule, none of them are going to be taken up with another RDJ solo flick. "There isn't one in the pipe," Downey said. "No, there's no plan for a fourth 'Iron Man." On the other hand, he dodged the question of "letting" someone else take the role of Tony Stark, saying, "I like that the idea is that it would be up to me, like I'm casting director for Marvel." So the question remains if Downey's appearance in Avengers 3 will actually be his last outing. On the one had, Downey has previously expressed a reluctance to give up the role to anyone else, saying that what he needed was some agreement between himself and the studio on where to go. On the other hand, it seems more likely that he'll bow out, given how tough the last round of negotiations were. And how long Downey will have been in that role once that third Avengers movie comes out.